The combination of orange and cream always reminds me of summer days spent by the pool, happily enjoying a Creamsicle while on a swim break. 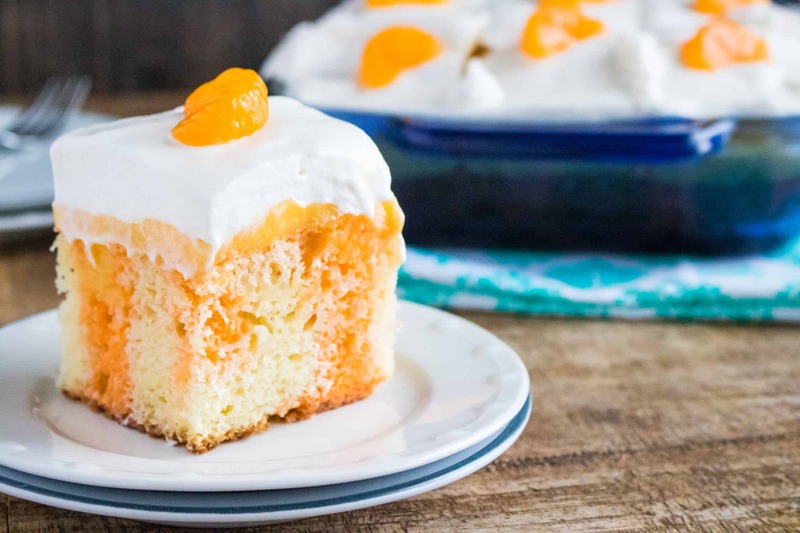 With warm weather on its way, and lots of pool time just waiting to be had, this Orange Creamsicle Poke Cake will get you one step closer to feeling those summer vibes. I have quite a few poke cake recipes on my site, but this one is especially light and fresh, making it a perfect addition to those summertime barbecues, picnics, and parties. Poke cake takes the idea of a glaze one step further. 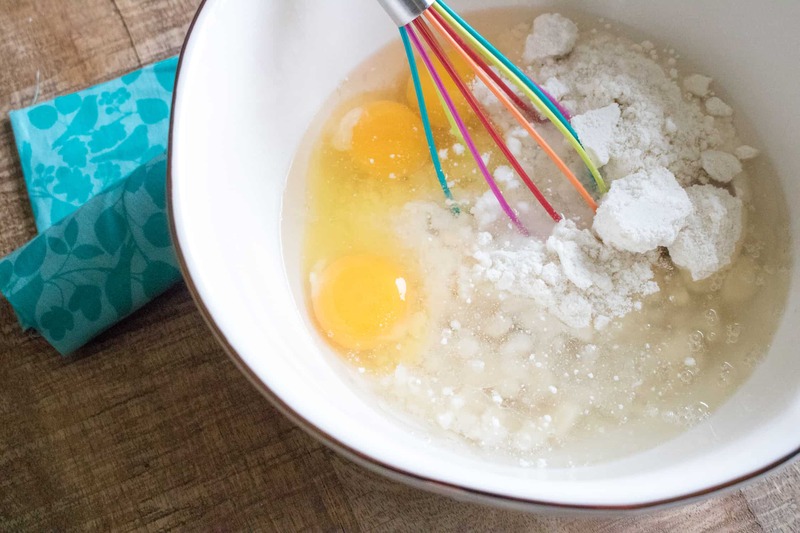 By poking holes in the top of your cake, then pouring on the flavoring of your choice, you can create an extra moist cake, infusing flavor into every bite. The airy and fluffy texture of the cake, combined with orange and cream, makes for a lighter and more fruity dessert. 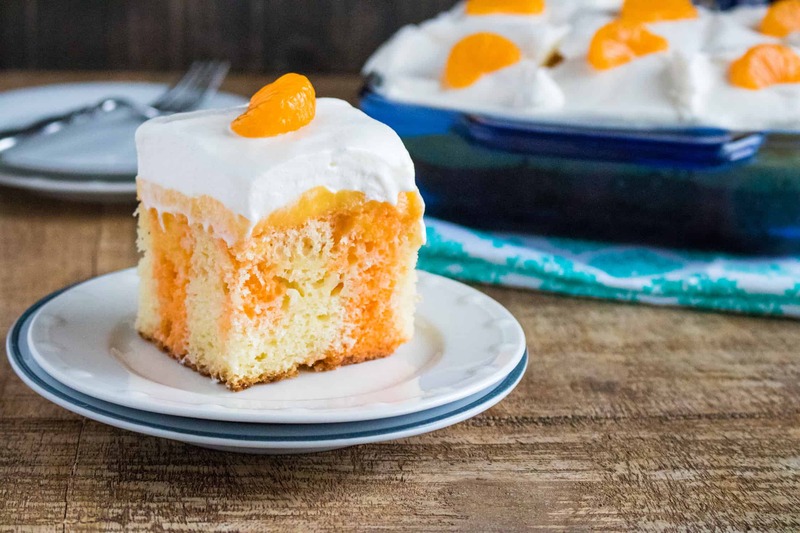 And, since this Orange Creamsicle Poke Cake is made with orange gelatin and canned mandarin orange slices, it’s easy to make it year round. Chilling your completed poke cake for 4 hours prior to serving will not only allow the gelatin to set, but gives the flavors sufficient time to truly meld. Why Are Mandarin Oranges So Good? Mandarin oranges are smaller than other varieties, and their skin is looser around the fruit, making them much easier to peel. They are also sweeter than conventional oranges, making them the perfect addition to salads and desserts. Clementines, satsumas and tangerines are all variations of the mandarin orange. As an added bonus, mandarin oranges pack a vitamin punch, with just one serving containing 53% of your daily value of vitamin C, 16% of your daily value of vitamin A and 6% of your daily value of Potassium. 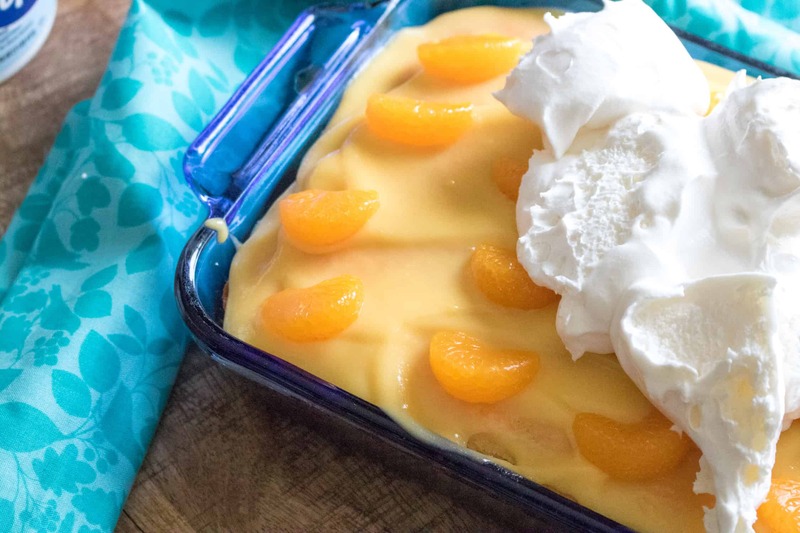 Oranges and cream make the perfect pairing because the acidity of citrus balances the richness of cream (in this recipe, whipped topping). 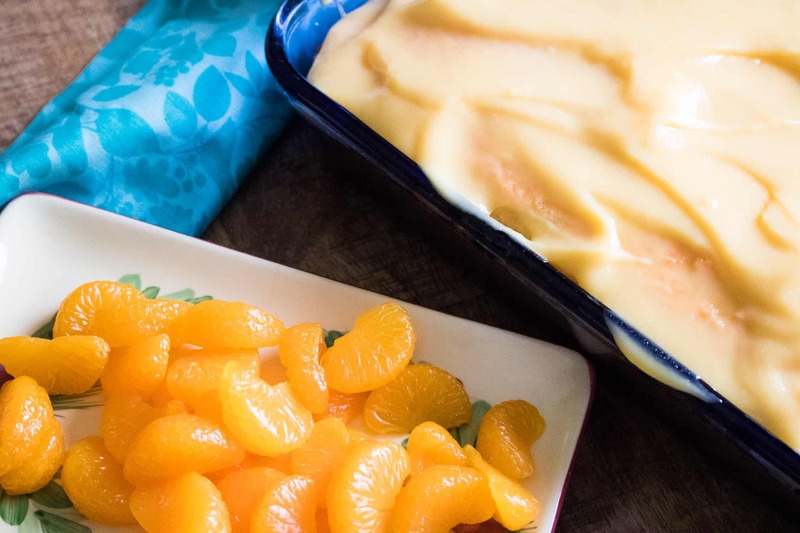 And if you are a fan of Creamsicles (a kid favorite that pairs vanilla ice cream with orange Popsicle), you’ll want check out this recipe for Easy Orange Fluff Dessert. First, bake cake in 13×9 pan according to package instructions. Allow to cool. 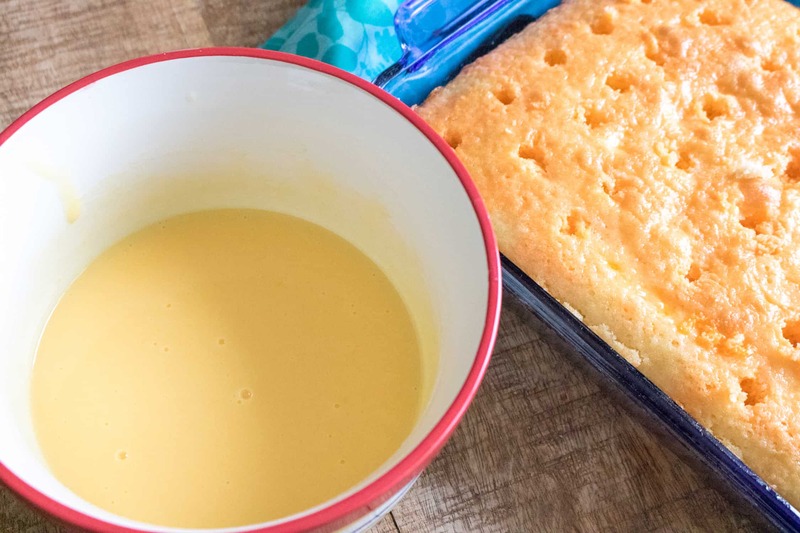 Mix together gelatin with 1 cup of boiling water until dissolved, and then pour the gelatin over the cake, making sure to pour over the holes. Add a layer of Mandarin oranges. Next, mix together French vanilla pudding mix together with 1 ½ cups of milk. Pour and spread over the cake. Finally, top with whipped topping and Mandarin oranges. Chill for 4 hours before serving. 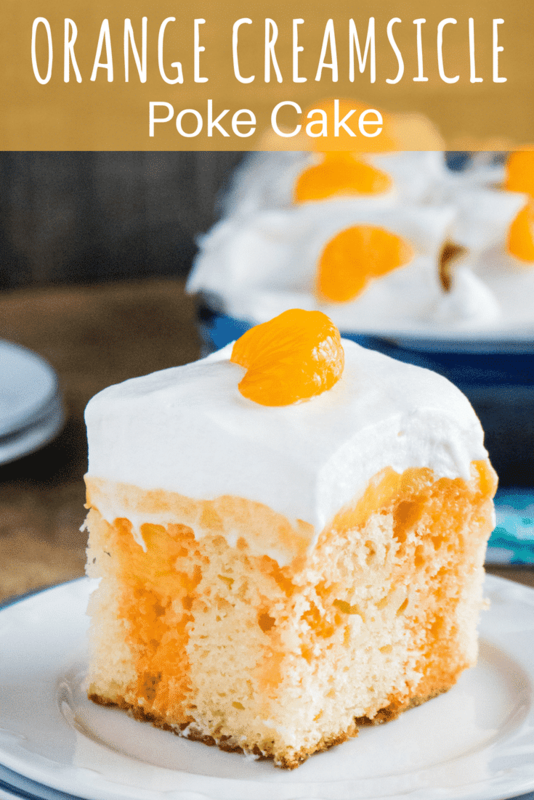 Orange Creamsicle Poke Cake is light, fresh, and the perfect addition to summertime barbecues, picnics, and parties. Add a layer of Mandarin oranges. Top with whipped topping and Mandarin oranges. Chill for 4 hours before serving.